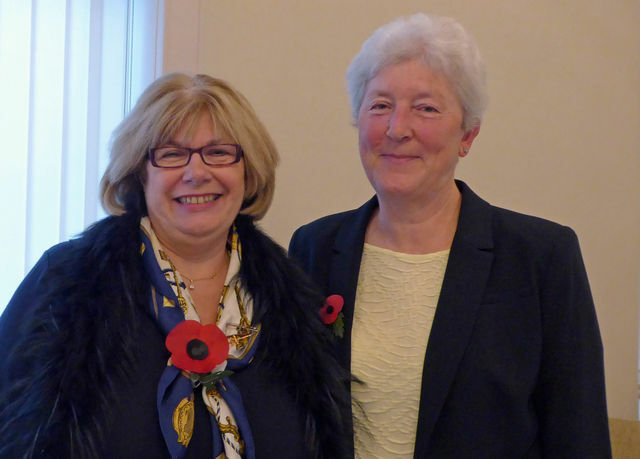 At the recent Warwickshire County Ladies Golf Association AGM held at Shirley GC, Anne PARRY was announced as the new County President for 2019-2020. After handing Anne her badge of office, outgoing President Caroline LASSEN said a few words to introduce Anne to the assembled company. Caroline commenced by stating that Anne had been involved with County golf for many years, being Secretary of the Association in 1996/97 followed by becoming County Captain in 2006. She went on to say that Anne had played golf to a very high standard being Surrey Junior Champion - a title she shares with the famous Laura Davies before playing for Surrey County and then Warwickshire. She played County golf for several years and was also Runner Up in the County Championship three times. She still plays off an excellent handicap. During this time Anne has been gainfully employed in Golf Magazine production prior to running her own PR and Marketing Consultancy. In conclusion, Caroline said she thought that Anne had all the credentials of being a very fine President and hoped that she would enjoy her two years as much as she had.